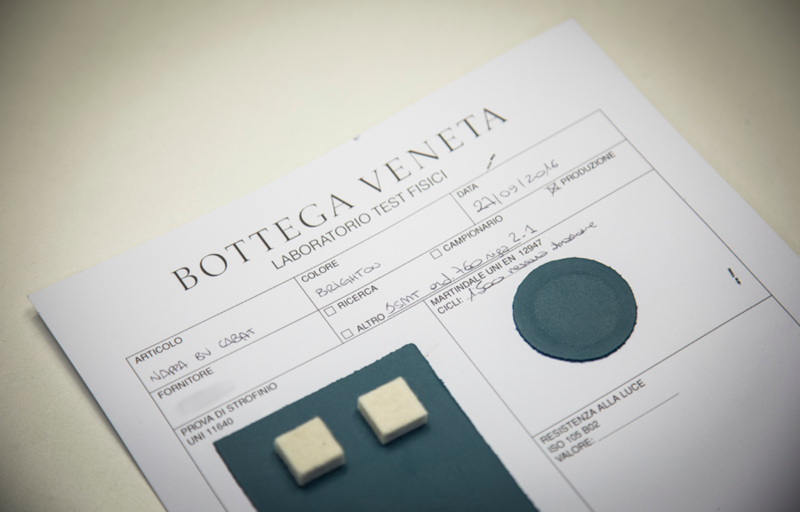 The artisans of Bottega Veneta make the label’s iconic accessories by hand on a sprawling Italian campus. There are brands identified by logos, and then there are those pinpointed for their craft. Bottega Veneta’s leather intrecciato motif falls into the latter as one of the most recognizable signatures of a fashion house. 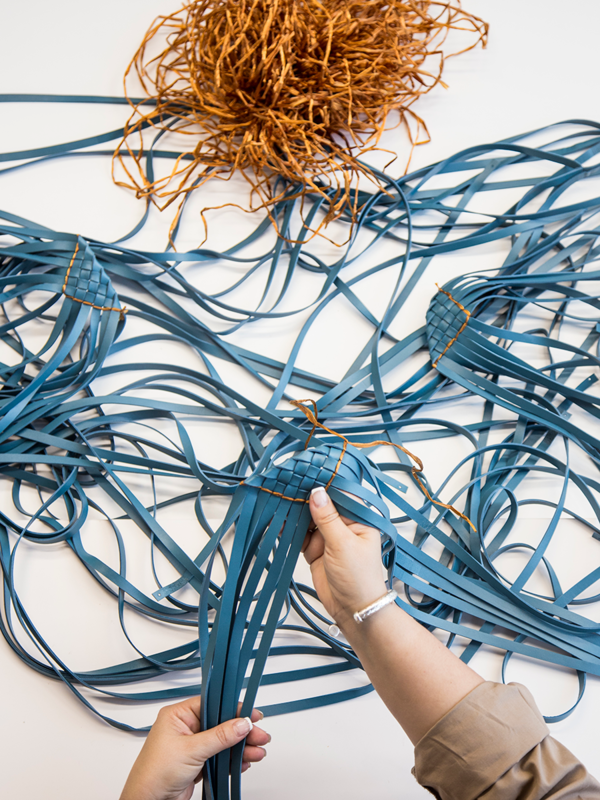 Since the ’70s, strips of materials have been hand-braided into a pattern seen on the Italian label’s bags, wallets, and even ready-to-wear garments and housewares. It was born from a happy accident. 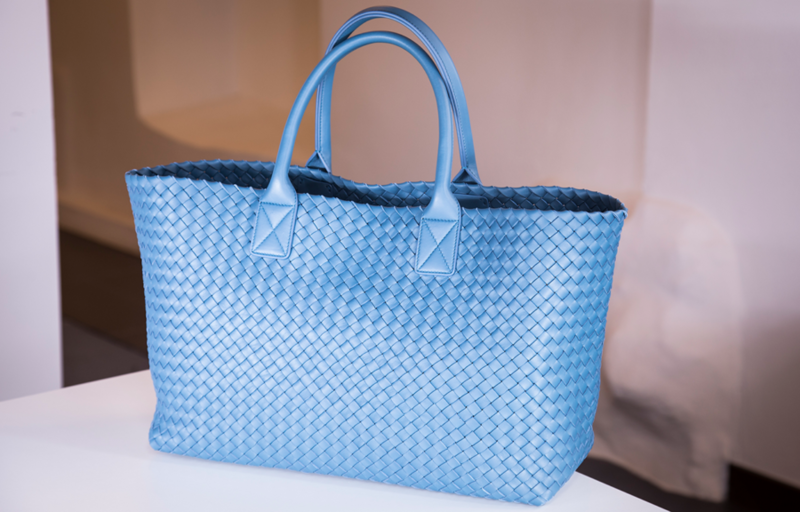 When Bottega Veneta was founded in 1966, sewing machines were sourced from the local region, then known for manufacturing fabrics, not leather goods. The height of the needles couldn’t accommodate thicker material typical of handbags, so light and pliable glove leather was used in its place, intricately and artfully intertwined for reinforcement. Creative director Tomas Maier—who celebrated his 15th anniversary at the brand last year, along with the house’s 50th—adopted the talent and know-how of Bottega Veneta’s artisans for his designs when he joined the company in 2001. One of his first uses of intrecciato was on the Cabat, a large, unlined top handle tote that has since become a mainstay of the brand, and which was his first handbag design for the label. “The goal was to create a bag that would be as beautiful on the inside as the outside,” Maier says. That ethos is mimicked by the brand itself: Bottega Veneta’s operations take place in an 18th-century villa in Montebello Vicentino, Italy, where the house was founded in 1966. It’s a majestic setting for an assiduous task. 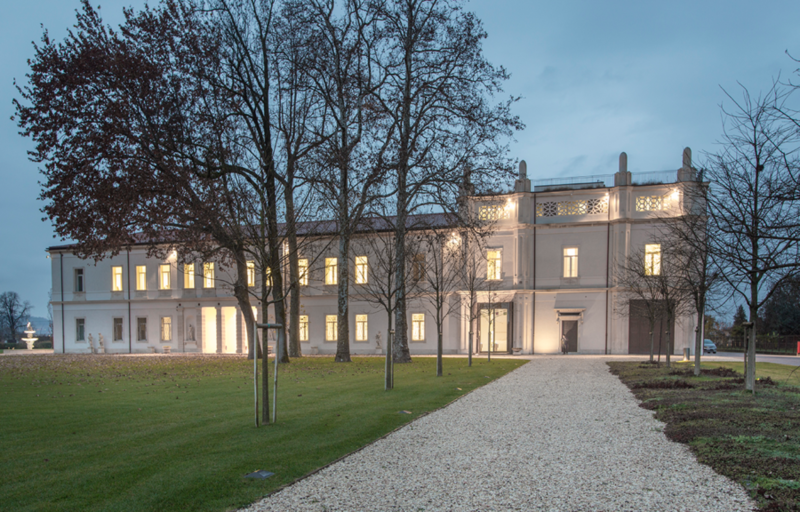 The laboratory of the headquarters, inside which intrecciato pieces are made, has a floor-to-ceiling glass facade looking out onto the sprawling grounds, surrounded by plush greenery and vineyards. “Our intention was to create an environment where people would want to go to work, where they would be stimulated,” Maier says. The craftspeople, of course, have great skill, and also strength—intrecciato is done standing up and requires substantial brawn. “One of the most significant events in the past 15 years was the first time I met the artisans, shortly before I joined the company,” Maier says. “I was very moved by their incredible passion for their work. As I’d suspected when I first walked through the doors, they were capable of incredible things.” A look at the artistry and handiwork distinct to Bottega Veneta sheds light on Maier’s appreciation for and engagement with the brand’s pursuits. “We always do a lot of research to find the highest quality materials,” Maier says. In fact, there’s an entire department dedicated to material research. Based on specifications for a design, raw leathers are purchased, oftentimes from Italian suppliers. Each is then thoroughly inspected upon arrival, and goes through a series of physical and chemical tests before being catalogued. From there, material is cut into the bag’s pieces. Technology allows the most to be made out of each hide: A machine dictates where to cut the leather in the most efficient way. Creating the Cabat’s woven motif starts by meticulously hand-crafting the double-faced strips of leather, or the fettucce, into 11 triangles. “The intrecciato is an elegant means to strengthen soft leather,” Maier says. It is essential the artisan maintains a consistent tension and ensures that each strip is at the same diagonal. Raffia is used at various steps as a guide to verify that the intrecciato is properly done. After the triangles have been made, they are assembled and woven on a stand designed specifically for the Cabat. 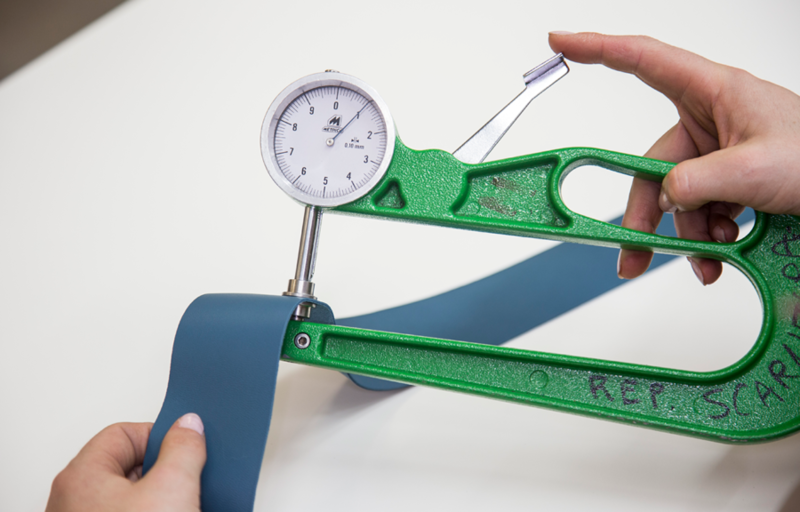 Preparing the Cabat’s signature handles includes measuring each piece for thickness, then reducing the edge thickness in order to make material more flexible and easier to sew. Both handles are lined in leather before being sewn with a thick thread. 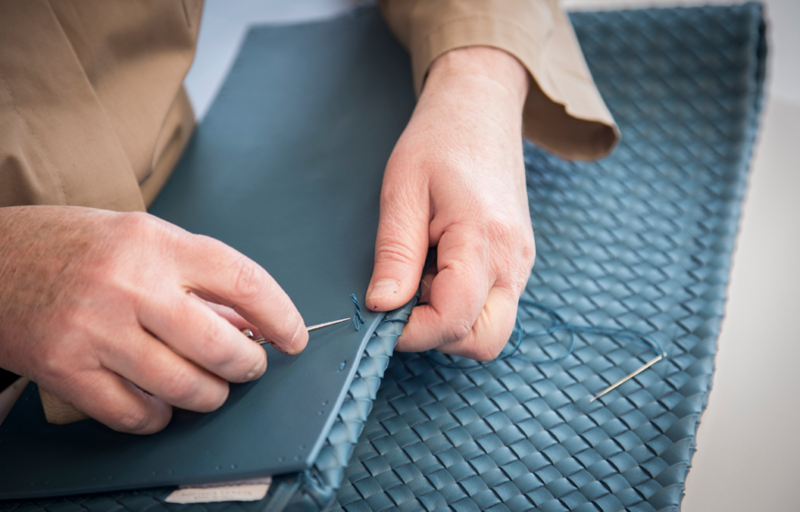 There are also pieces of the bag that are cut with a raw edge, which are finished by hand in a long, eight-phase process. The manual steps include brushing and recoloring. When the weaving is complete, the different layers of overlapped double-faced leather strips result in a bag that is identical on the inside and outside. Next, around 80 seam points are stitched by hand to attach the base and the handles. Each finished piece is inspected to ensure it is up to snuff.